It can be quite a challenge shooting a group portrait, particularly in a busy working environment and when time isn’t on your side. This picture came together in no time at all and marked the end of a fascinating and fruitful day, shooting a library of reportage photographs for Diverse Marine on the Isle of White, commissioned by the good folk from Brand Design. I got a call from my old friend Mikey Harvey.. how did I fancy shooting a series of Alpine passes for a new premium automotive magazine called The Road Rat? Of course I said yes. With three locations chosen, a couple of Michelin maps in the glove box and hotel and Eurotunnel reservations made, Claire and I hit the road.. After 5 long days, 146 caffè lattes, numerous marmot encounters and with 1987 miles behind us.. we were back. The mountain passes were truly breathtaking and recording them was not a straight forward task. Instead of cropping a single super wide shot, I decided to shoot panoramics using the ALPA 12 STC, ALPA HR Alpagon 4.0/40mm SB17 and a nodal rail. The scenes before us were so vast that some of them required 12 stitched frames. You can see a small selection of the work we made below, with more examples here. For The Road Rat magazine subscription information, head over here. The Col de la Bonette. I was recently invited to judge the CEWE and MIND Charity 'My Inspiring Moments' competition. I strongly believe that spending time in the landscape is an extremely therapeutic, healing and worthwhile thing and so was very happy to accept the invitation. When asked to pick a single image that defines my inspiring moment, I chose the image below, which was made in Glen Brittle, on the Isle of Skye. It was made on a wet and wild winter’s day and although it was a challenge, It was the first time that I felt I’d actually made a photograph that illustrated how I actually felt when standing in a Scottish landscape. 12 winners will be chosen to feature in a bespoke charity calendar curated by myself, plus all entrants will automatically be entered into the CEWE Photo Award 2019, the biggest open photo competition in Europe. For competition entry details head here. I was recently commissioned by Aston Martin to photograph the stunning new limited edition Rapide AMR for it's timely launch..
"As Aston Martin returns to Le Mans to defend its 2017 victory at the iconic 24-hour race, so the latest car in the exciting new AMR stable has been unveiled. 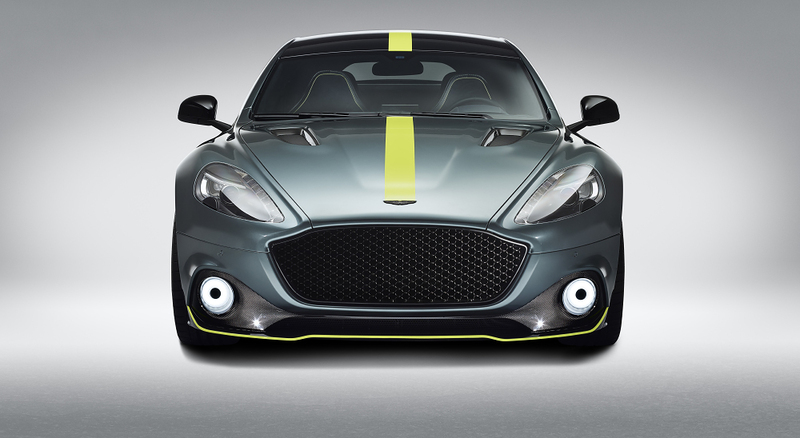 Following hot on the heels of the DB11 AMR, Aston Martin has revealed the limited edition Rapide AMR. This production version of the concept shown at Geneva last year is limited to just 210 cars." As is often the way when photographing a sought after production vehicle, you have to achieve a lot in a short period of time, so a big thank you to my 'pit crew' for their hard work and focus during a long studio day. Below is a selection of the work, with larger versions available here. Further new work for Bletchley Park is now live, commissioned by the good folk at Rose Design. I was asked to photograph the Enigma machine. It was both fascinating and a privilege spending time with such a historically significant piece of equipment, one which was indirectly responsible for saving so many lives through the cracking of it's code. Bletchley Park is the home of the World War II Codebreakers. There’s so much world changing history that’s been made here, it is a truly fascinating place. I’d recommend that anyone with an interest in World War II, coding or code breaking, spend a day here. Client : Bletchley Park. Agency : Rose Design. AD : Garry Blackburn. One of the ads is shown below, with more of the work available to see here. I was asked recently to make a portrait of my good friend Alan Moore, designer and author of Do Design - Why Beauty Is Key To Everything and creator of Beautiful Business. I was also asked to shoot a series of location portraits for him, which we shot in London, Snowdonia and Norfolk, and which you can find here. Alan created my very first corporate identity, back in 1988 when we were both based in the beautiful Spirella Building. I have fond memories of that studio. It was spacious and had a huge arched window at one end providing gorgeous soft daylight, and had its own darkroom. The lovely folk at 23red, commissioned me to shoot a series of atmospheric ads for Network Rail, for their Midland Mainline Safety poster campaign. The imagery had to be used across 6, 48 and 98 sheet sites, and so I chose to shoot on my ALPA 12 MAX and PhaseOne IQ MFDB combo, in order to achieve the largest possible file size and resolution. A big thank you to the Network Rail safety team that watched our bright orange backs, while we worked. Client : Network Rail. Agency : 23red. AD : Tristan Cavanagh & Tom Mann. Below are 3 of the 48 sheet ads.. I was recently commissioned to shoot a bank of imagery for the Canaan Winery, in China. Over the week we shot a mix of landscapes, working portraits and industrial architecture, which I'll be able to share later this year. On our last day we had a few hours spare, and so I suggested to Neil the art director, that we shoot some portraits of the vineyard workers, whose infectious smiles and laughter had captivated us all week. A makeshift daylight studio was set up close to the vineyard canteen and we made around twenty portraits. You can find a selection of them here. Client : Canaan Winery. Art Director : Neil Southwell. They're building cars in Newport Pagnell again! I was recently commissioned to photograph the stunning DB4 G.T. Continuation for Aston Martin Works Service. I spent a day at the original Aston Martin facility in Newport Pagnell, recording the final stage of the build taking place, followed by a test and set up day at Millbrook Proving ground. "Ahead of its time – and more often than not the opposition – the DB4 G.T. was a new breed of competition car. In modern parlance it was a homologation special, highly evolved from the series production DB4 on which it was based. Blessed with intensified performance and enhanced agility, the DB4 G.T. stole a march on both Jaguar and Ferrari, cementing Aston Martin's position as makers of world-beating GT cars. Now, Aston Martin Works are making history by celebrating one of Aston Martins greatest cars with a special series of 25 Continuation cars." I love everything about this stunning car.. the look, the sound and yes.. the smell. Client : Aston Martin Works Service. Agency : Freestone. New work commissioned by the good folk at Rose Design, for The View From The Shard is now live. We were given special access to shoot at dawn and dusk, over a number of days. The views of London from this iconic building really are truly breathtaking. "Designed by Master Architect Renzo Piano, The Shard has redefined London’s skyline and quickly established its place as a dynamic symbol of London. At a height of up to 800ft or 244m, and at almost twice the height of any other vantage point in London, visitors will experience unrivalled 360 degree views over the city for up to 40 miles on a clear day. Begin your journey in our extraordinary high-speed lifts that carry you from Level 1 to Level 68 in sixty seconds. Once there, enjoy spectacular panoramic views of the capital from our Level 69 observation deck whilst unwinding with a glass of champagne, or share a moment with a loved one spotting London’s famous landmarks from our open air sky deck on Level 72, where exposed to the elements you can take in the atmosphere and sounds of the city below"
Below are just 3 of the 48 sheet posters from the ongoing campaign.. Client : View From The Shard. Agency : Rose Design. AD : Garry Blackburn & Simon Elliott. New work for Bletchley Park is now live, commissioned by the good folk at Rose Design. We certainly reaped the rewards of the 03:30AM call time, as you can see below. More of the work available to see here. New work for GE is now live. The GE Oslo shoot was a perfect example of a team effort. We were working under reasonably tight time and location constraints, shooting real people in their busy working environments, and so we had to remain as flexible as possible. Working with an experienced and flexible art director meant we could quickly explore visual ideas as they presented themselves, and working with a seasoned production crew meant we could work unhindered, knowing everything was at hand.. and all I had to do was think about making the pictures. It was a memorable shoot, and for all the right reasons. Client : GE. Agency : Seven Stones. AD : Justin earl. Below is a small selection of the work we made, with more examples available here. I was recently commissioned to shoot a story for Land Rover’s Onelife magazine, on the Reborn project. Spending two days in Land Rover’s Solihull manufacturing site, surrounded by history and witnessing first hand the amazing restoration work that the Reborn team are undertaking, was a real honour. For anyone who has a passion for Land Rovers, seeing these beautiful Series 1 vehicles up close, and understanding exactly where the Land Rover story started, is highly recommended, and you can do just that on a Land Rover Reborn Tour. You can also find more information on the Land Rover Reborn project here.